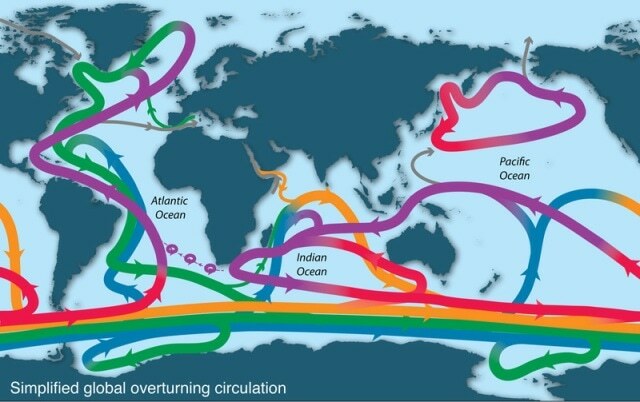 Ocean overturning circulation illustrated. (CREDIT: co-author Lynne Talley). A team of scientists used a computer model to synthesize millions of ocean and ice observations collected over six years near Antarctica, and estimated, for the first time, the influence of sea ice, glacier ice, precipitation and heating on ocean overturning circulation. Overturning circulation brings deep water and nutrients up to the surface, carries surface water down, and distributes heat and helps store carbon dioxide as it flows through the world's oceans, making it an important force in the global climate system. The scientists found that freshwater played the most powerful role in changing water density, which drives circulation, and that melting of wind-blown sea ice contributed 10 times more freshwater than melting of land-based glaciers did. "If you were to turn off these winds and eliminate that pathway for moving sea ice away from Antarctica, you would probably significantly reduce the strength of the overturning circulation," said lead author Ryan Abernathey, an oceanographer at Columbia University's Lamont-Doherty Earth Observatory. The study, published this week in the journal Nature Geoscience, uses a sophisticated approach to examine on the complex problem of what is happening down under the ice, where direct observations are hard to come by. It provides new insight into the basic physics of the ocean that may be critical for answering future questions about climate change, such as how loss of sea ice or changing winds could affect global ocean circulation, said Abernathey. "Everyone is asking, is sea ice expanding or contracting? We're coming at it from a different perspective: What does sea ice do to the underlying ocean?" Abernathey said. When sea ice forms around the edges of Antarctica each winter, the salt in the ocean water doesn't freeze; it stays behind. That makes the water near the coast much saltier and therefore denser than water off shore. Denser water sinks, and in doing so pushes less dense water up, driving circulation. Meanwhile, as sea ice melts farther out in the open ocean, it deposits its less-dense freshwater, moving denser water down. Scientists have known for some time that changes in water density, particularly the sinking of cold, saline water, contribute to the ocean's "abyssal circulation," the deepest, coldest branch of the ocean conveyor belt, which moves cold Antarctic water northward along the ocean bottom. What has been less well understood is the role salinity might play in the "upper circulation," which carries mid-depth water up to the surface in the Southern Ocean and eventually toward the tropics. Using an analysis technique called water-mass transformation, the scientists were able to quantify the rate at which ice freezing and melt contribute to the upper circulation by making water near the coast denser and water in the open ocean lighter. "This work shows really clearly that Antarctic sea ice plays a crucial role in the circulation of the world's oceans," said coauthor Paul Holland of the British Antarctic Survey. "We have known for many years that the freezing of Antarctic sea ice in winter is responsible for forming the very deepest waters in the world oceans, but this study shows that melting the ice in summer also governs the formation of shallower waters. This advance has only been made possible by the state-of-the-art computer model used in this study, which assimilated millions of ocean observations."